And by “oddities” I don’t necessarily mean the other Trouble with Comics folks, or Ryan. Trouble with Comics had a massive response to Question Time this week…so massive that the responses were posted in three parts, all of which can be found here. The Question this time around is “what are your three favorite current titles?” and you can find my response at the end of Part Three. Also, Twitter pal Ryan is Kickstartererering a comics-related novel he’s written, Four Color Bleed , and you can check out the details about that, including a preview sample of the novel, right here. Plus, my pal Weshoyot is one of the artists on the project, so you’ll be helping her out, too! Now, why Eek! 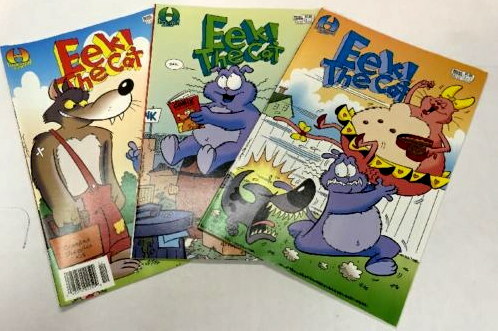 the Cat and Freaked were paired up like this, aside from Hamilton having these apparently piled up in a warehouse and undistributed to comic book shops (sadly, because I would have been all over that Freaked comic) I don’t know. But this was bit of an oddity, I thought, and what use is this blog if I can’t showcase oddities? I come here for obscure comics and you, sir, purvey! Eek and Freak, they both do leak (or not). Was a third book Brother Power? There’s a ton of those Freaked comics in Australia. I bought 20 for a dollar each last year, maybe I could send you one?